Climbing ladders and walking on roofs can be dangerous if you’re not armed with the right equipment. 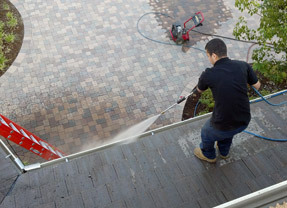 Utilizing our convenient on-point scheduling, Window Wizards’ expert gutter cleaning service is about to make your life easy and worry-free when it comes to something as important as clean, free-flowing gutters. * Water in Basement – When rain water comes straight off your roof instead of out through your downspouts it often has nowhere to go other than down along your foundation and into your basement. * Ice Dams – During winter’s freeze and thaw cycles, water held by ice dams pushes back underneath shingles and can seep into your attic and walls, causing water damage. * Mosquito Breeding Ground – Free-standing, debris filled sludge and water – which is exactly what’s sitting in your dirty gutters – is where mosquitoes breed!